Product Name: Sticky Roller Handle Product Specification: The Sticky Roller Handle is used with the sticky roller, the different specification of the sticky rolls match the different sticky roller handle. Product Specification: The sticky roller handle is used with the sticky roller, the different specification of the sticky rolls match the different sticky roller handle. 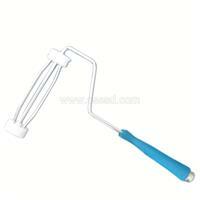 It is convenient to use, which can effective remove the dirt of the floor, roof, wall and other surfaces. Product Specification: 4inches, 6inches, 8inches, 10inches, 12inches.